As cars are turned away from the Hollywood sign trailhead in Los Angeles for workers to install a gate, traffic from tourists hoping the see the sign is clogging up Hollywood Hills roads to the chagrin of local residents. City workers are installing a new gate at the Hollyridge trail head to keep trespassers off the hiking trail at night. During the installation, only people with horseback riding reservations can park by the trailhead. Warning signs on the street telling those heading up the hill toward the trail to go to Griffith Park instead, where they can board a shuttle to see the iconic white letters. But many tourists are ignoring the signs, and being turned around anyway. "We don't know what we're going to do next," said Victor Borkovsky, a Canadian tourist who followed GPS directions to Beachwood Drive. Another driver, Jane Guapo, said she will find a different route to the sign. 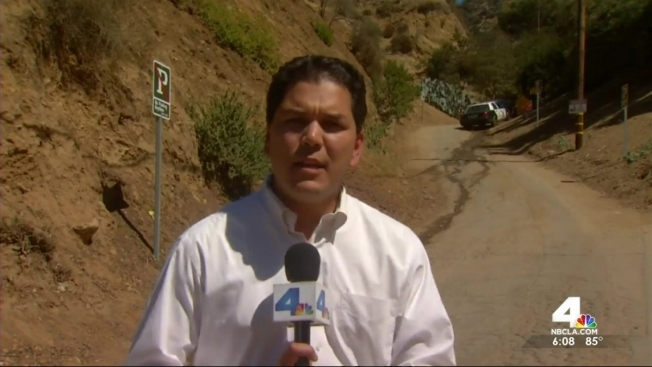 "We don't want to go to Griffith Park because there's a lot of traffic over there," Guapo said. Traffic caused by the tourism has long drawn the ire of people who live in the Hollywood Hills. "They are blocking driveways, (they) urinate in bushes, stand in people's driveways," said longtime resident Jay Heit. "This is not a location to handle tourists but it's turned into that." Mayor Eric Garcetti said the city is trying to come up with ways for tourists to see the sign without disturbing the neighborhood. "There are better places and better ways to see the sign than going through constricted roads that aren’t even pleasant for tourists," Garcetti said. "We are going to do the best we can to educate those companies, put up signs wherever we can and look for a long-term solution."